There are many odd things to put down, and, lest who reads them may fancy that I dined too well before I left Bistritz, let me put down my dinner exactly. 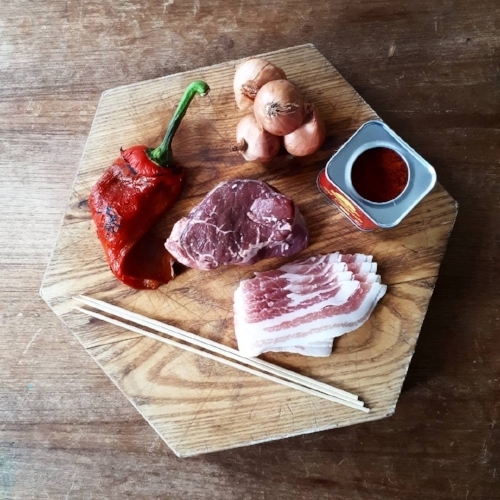 I dined on what they called “robber steak”- bits of bacon, onion, and beef, seasoned with red pepper, and strung on sticks, and roasted over the fire, in simple style of the London cat’s meat! During the Australian summer, which lasts from approximately September - May (I may be exaggerating, but my memory is of being consistently too warm), we would cook on the barbecue most evenings. We'd keep the kitchen cool any way we could, and standing by a barbecue, tempting an evening breeze, was far preferable to standing inside next to the hob. On weekends and holidays, the parks and beaches are full of people barbecuing, pulling sausages, steaks, and whole fish out of eskies (cooler boxes) and placing them over the grill. I remember rubbing scrunched up newspaper across the plates, cleaning off the remains of barbecues that had gone before, learning from mum and dad how to set up the coals (or flick the ignition switch on the fancy ones), and then cook the meat and vegetables to perfection. It's been years since I've had a proper barbecue at home. Those disposable foil ones, the ones that end up strewn throughout London Fields every Monday morning, are a poor imitation. Your best bet, if you don't have access to a proper barbecue, is a cast iron griddle pan, over a gas hob. It's not quite the same, but it does give the gorgeous charred flavour familiar from cooking outdoors, and the ritual of standing in front of a barbecue (turning the skewers slightly too often). This 'robber steak', which I was reminded of when rereading Dracula last week (it's October - if there's a 'best' time for reading or rereading Dracula, it's now), is a perfect addition to any barbecue. Likening the cooking style to 'London's cat meat' may not sound appealing, but the dish itself is a collection of lovely things, all of which work incredibly well over a flame. It's destined to become a regular addition to my outdoor cooking repertoire - I can't wait to throw some onto the barbecue in Australia this summer, or to make some for Hallowe'en next week. *It might be tempting to use a packet of chopped stewing beef, the kind you can find easily in a supermarket, but I'd recommend choosing something you'd happily eat as a steak (sirloin or fillet work well). You're going to be grilling it quickly, rather than letting cook down over a nice long time, and you don't want it to be tough. 1. First, roast the pepper*. This can be done in advance, if that's easier; I often store a few in the fridge to have in pasta or sandwiches. Over an open flame on your hob, or under the grill in your oven if you have an electric hob, char the pepper until completely blackened. Place into a plastic bag, and tie it closed. Leave until cool before rubbing the charred skin off. Store in the fridge until you need it. 2. Soak the skewers in a bowl of water for at least fifteen minutes, which will prevent them catching fire while you barbecue/grill. Slice the beef into generous chunks, and place in a bowl with the olive oil and paprika. Toss them around until they are completely covered. Peel and halve the shallots. 3. Thread the bacon onto the skewer and weave it around pieces of beef, onions, and folded pieces of red pepper. Don't crowd the skewers too much, or the bacon won't cook. 4. Heat the griddle or barbecue, and place the skewers onto it. Cook until blackening in places, then turn the skewer. Continue cooking until the bacon fat has rendered and crisped up a little. Eat immediately. * Of course, you can barbecue slices of raw pepper on the skewers, but it's one of my (no longer) secret pet hates at a barbecue - simultaneously too burnt, and too raw. I find roasted pepper much more delicious here - and everywhere.